My little girl is growing up! It’s hard to believe how fast it happens, and I know any parent out there can relate! My daughter moved into her “big girl room” shortly before she turned two (to make room for her new brother in the nursery), and we hadn’t updated her bedroom since then. Because of that, we all agreed it was time to give her bedroom a little refresh. 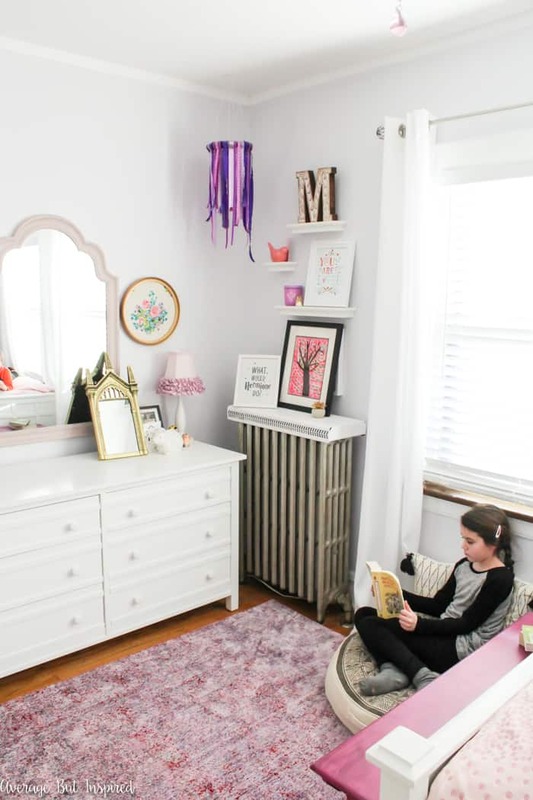 Her tween girls bedroom makeover turned out pretty darn cute on a small budget, and I’m excited to show you the space and share some tips for decorating a bedroom that grows with your child! This post contains affiliate links. To read my full disclosure policy, please click here. Before we gave it a new look fit for a tween, my daughter’s bedroom was very juvenile. 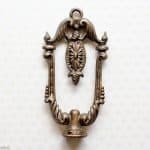 You can see pictures of the old look in this post where I painted a piece of furniture for her room. One great thing we did all those years ago was pick a neutral paint color for the walls. Because of that, and because the paint was still in good shape, we didn’t need to repaint for this makeover! So come on in and let me show you around! You’ll notice that the furniture is the same in the room, too. We were smart enough to purchase furniture that we knew would grow with her as she got older. This means she’ll get maximum use out of her bedroom set and we weren’t stuck trying to offload toddler size furniture for this makeover. 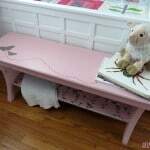 The only difference in the furniture is that I gave the butterfly bench a paint job (“butterflies are babyish, mom”). 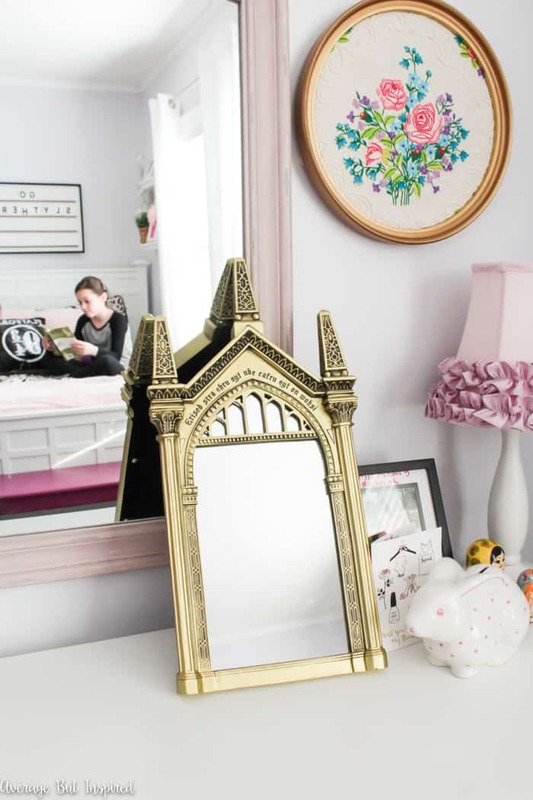 She’s a real Harry Potter fanatic, so little dashes of Harry Potter fun are sprinkled throughout the room. They’re all in inexpensive objects that easily moved or replaced if/when she outgrows her Harry Potter phase. 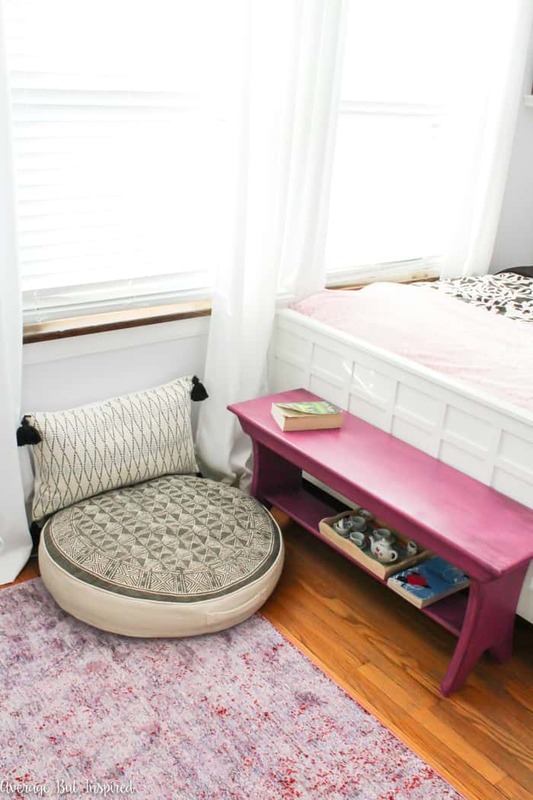 For example, the flippy sequin pillow on the bed, and the changeable letterboard above the bed. 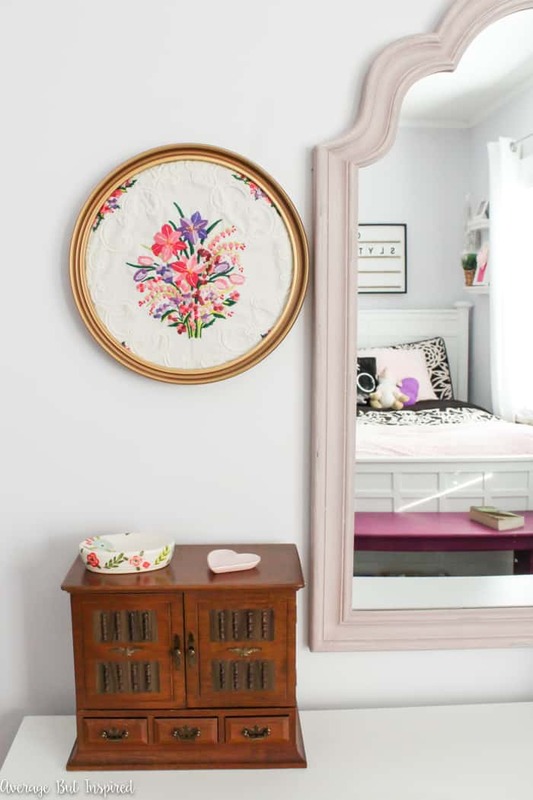 You’ll also notice the Mirror of Erised on her dresser and some printable art from Etsy on a shelf. 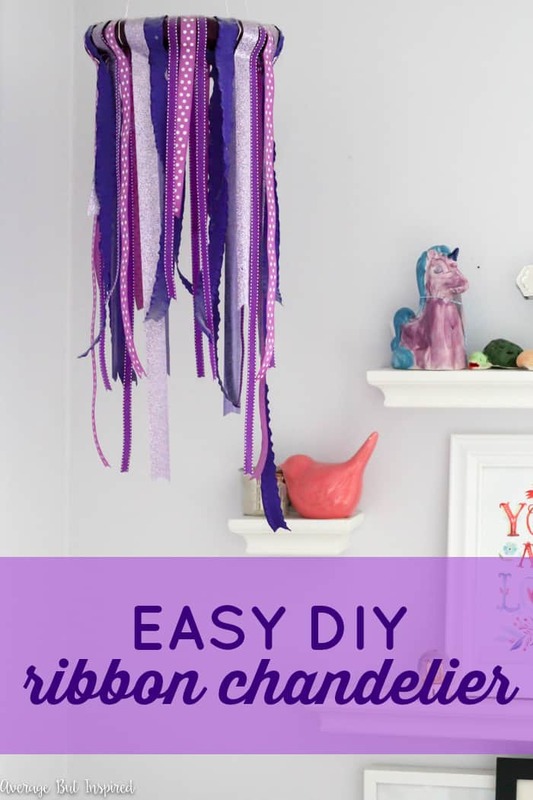 Instead of investing in expensive themed items like a comforter or wall art, inexpensive items like this give her the sense of a “theme” in her room, and when she changes her mind I won’t be upset about swapping out those items! She chose the black and white comforter herself, and that was a compromise on my part! I really didn’t want black and white for her, but since it’s her room, I gave in. I made sure to soften it with other colors in the room, like varying shades of pinks and purples. The new lavender overdyed rugs were a steal, and I love the beautiful jewel tones they bring to the space! The funniest part about the room is the little reading nook area. She really wanted a reading nook and she begged me for a beanbag chair. I couldn’t believe how expensive those beanbag chairs are, so I found a dog bed at HomeGoods for half the price of a beanbag, and I told her it was a book pouf for the floor. She loved it until she found a tag I forgot to remove that says something about dogs. Ooops. Well, I eventually convinced her that nobody will know it’s for dogs, and she seems to be okay with it now. Other little changes to the room include things like new curtains (I LOVE the ones we put up because they filter the light and have such nice drape and flow), and a new mirror over the dresser, which I found at HomeGoods for $24. Score! 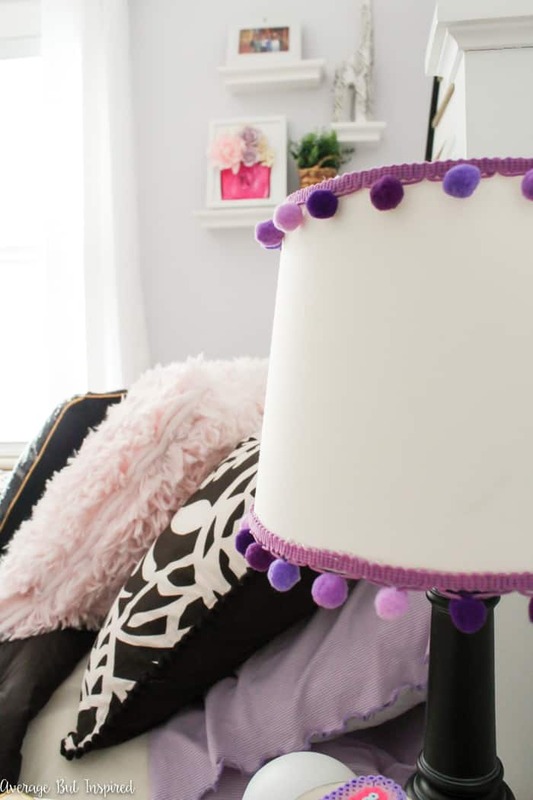 Pom pom trim added a fun touch to a plain lampshade, and I’m trying to convince my daughter to let me add it to the edge of her reading pouf, too! So there you have it! 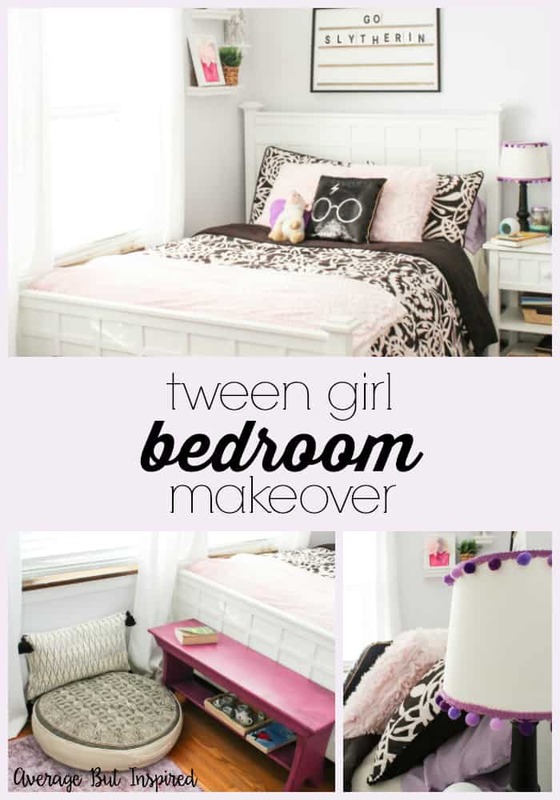 With some simple swaps, we created a tween bedroom that my daughter and I both love. Thanks for checking it out! Click any of the photos below to shop! What a beautiful room, and what a lucky girl. I love the pom pom edge on the lampshade, and that you invited her personality in the room with the Harry Potter touches. 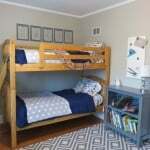 If kids feel that they’ve been a part of putting their room together, they are more likely to put things away and keep it in good shape.